Donald W. Burnes, PhD., Founder of The Burnes Center on Poverty and Homelessness at the School of Graduate Work, University of Denver. 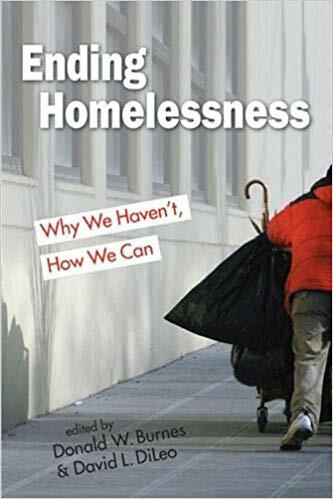 This is a must read book for those who want to know why we haven't been able to end homelessness. Community Compassion Outreach (CCO), Inc., is a 501(c)(3) public charity in Durango, Colorado. Our work aims to eliminate prejudice and discrimination of people in poverty and homelessness. As advocates for our clients and constituencies, we are committed to defend human and civil rights. Updated 1/31/2019 — NO CHANGE TO CAMP BAN. 2. Designated areas to camp will be announced sometime in the near future. The Public may speak at City Council meetings which are held at the City Hall on 2nd Avenues. Check City Calendar for upcoming City Council Meetings. CCO wrote a letter to the City of Durango in an effort to encourage lifting of the current camp ban moratorium. Homeless people would be subject to harm in winter temperatures when the camp ban forces people to be outside their tent dwelling between sunrise and sundown. While the homeless in Durango and La Plata County have no place to sleep, camp, or live in vehicles due to current camp bans and safety concerns of fires -- Community Compassion Outreach reached out to the National Law Center on Homelessness and Poverty (NLCHP) and the American Civil Liberties Union (ACLU) for advice. Individuals experiencing homelessness have been camping in the mountainsides of San Juan National Forest, on county and city public spaces for many years. Since the City started enforcing an ordinance making it unlawful to sleep or camp on public spaces, our constituents have reported property damages and loss of valuable personal documents, laptops, cell phones, blankets and sleeping bags/tents. CCO believes that people who have no place to go when an ordinance or law is enforced, and when there is no bed space or shelter available, the homeless have rights as U.S. citizens. When the homeless must perform natural bodily functions (sleep, sit, kneel, stand, lie down, urinate, defecate, eat), and when there are no facilities or shelter available, the Constitution protects them from "excessive fines imposed", "cruel and unusual punishments" for being homeless. On Monday, September 10th, a second communication to the City of Durango from the ACLU to share the supplemental authority that directly supports the legal arguments made in their letter of 8/24/2018. Copies of the September 4th Ninth Circuit Court decision which denied the City of Boise's motion for summary judgement in a case by homeless individuals challenging the City's enforcement of its camping ban. The Court held that the Eighth Amendment prohibits enforcement of a statute prohibiting sleeping outside against homeless individuals with no access to alternative shelter. (Scroll down to view Martin vs. City of Boise). What to do if you are homeless ... told you cannot sit, lie down, stand, kneel, camp or eat on public spaces? Please contact 'Donna Mae' Baukat here. Homeless in Durango - What you should know. . .
​​​"Some municipalities target persons experiencing homelessness by conducting sweeps of areas where homeless individuals sleep, rest, and store belongings. During sweeps, police or city workers may confiscate and destroy belongings in an attempt to “clean up” an area. A policy that establishes procedures for disposing of property discovered during the cleaning of public spaces can ensure that the owners are afforded due process of law and provided with support by appropriate service provider agencies. For further information, please see the National Law Center on Homelessness & Poverty’s model policy for cleaning public spaces." Disclaimer: CCO or its representatives do not provide legal advice, except to provide information to the public. Subscribe to receive updates and notices.